Even though the Lenten journey is a serious one, leading to an intense Holy Week, I am also looking for signs and symbols that point me to hope along the way. Because Lent and Easter are so late in the calendar year this year, the days are accompanied by the signs of spring, even in our supposedly “season-less” Southern California. My irises in the drought resistant garden are thriving, especially with the unusual rainfall. There has been a constant parade of beautiful blooms beginning in Advent (white) and continuing on with Lent, all purple, four come and gone, four to about to burst forth. The liquid amber tree and the fig tree next door have tender green leaves and shoots multiplying each day. The ornamental plum tree and the peach tree are showing their tiny flowers. All of them remind me that after the winter, after rain, after the Great Grayness there is Hope. The Creator has made each thing beautiful in its own time. Another sign of hope has been discoveries of missing things. In my clearing out and de-cluttering, I have found things that I believed to have vanished–some pairs of socks, a quotation that I had written out on a card with decoration, some pairs of old shoes. I am reminded, even in the simple nature of the retrievals, that with the Holy One, nothing is lost, there are no final defeats. Hope can spring up. Some signs locate me. 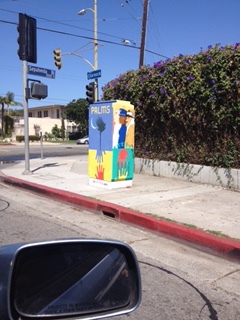 Some creative people in the neighborhood painted the power boxes on many corners with folk art, reminding us of who we are, where we are, a gathering of people from many nations, places and beginnings. And we are people who in proximity to the freeway are people on the go, working, traveling, walking the dog. It is important to me as I journey, not to forget where I am grounded, where I am heading and whence I have come. In the providential movement of this season, I have been engrossed by three memoirs, chosen without intentional theme, that have reflected to me a part of my beginnings that still shape me, but from which I have moved. Each writer comes from a different place than I have geographically, and each one is younger, but we have in common a shared religious heritage that gave us great gifts and enormous challenges. As I watch and listen to each voice, I am filled with hope. Thought there have been moments of pain, or disorientation, of wandering without a map, each woman has found her spiritual center, her place of belonging and her traveling mercies. I have found joyful hope in locating myself at points on each journey, and sharing moment of Grace. I am finding that Lent is not only solemn and gray, but is also alive with reminders that Light and Darkness together are part of our human pilgrimage. This year it is profoundly important for me to remember that here on earth, although there is tremendous grief and suffering, there is also the whimsy, laughter, cheer, surprise of hope that manifests itself, sometimes daily–in the smile of the server, the grace of the responsive leader, the compassion of the helper, the delight of the discoverer, the unfettered laughter of old friends, remembering the way we were, and how it is Grace that has led us safely this far. I have taken on as a Lenten practice to look for those signs. I am reminded of an old Brian Andreas drawing in which the angel appears to him in tights, he laughs and then knows that when signs appear, if there is no laughter in them, they are not for him. Nor are they for me. And neither are they for me if there is no Grace, no Joy, no Hope. On our way through Holy Week I am like the faithful one singing Psalm 126 of Ascent: ..our mouths were filled with laughter, and our tongue with shouts of joy…the Lord has done great things for us, as well as small ones, in tiny but unmistakable signs. In Lent, I can rejoice.